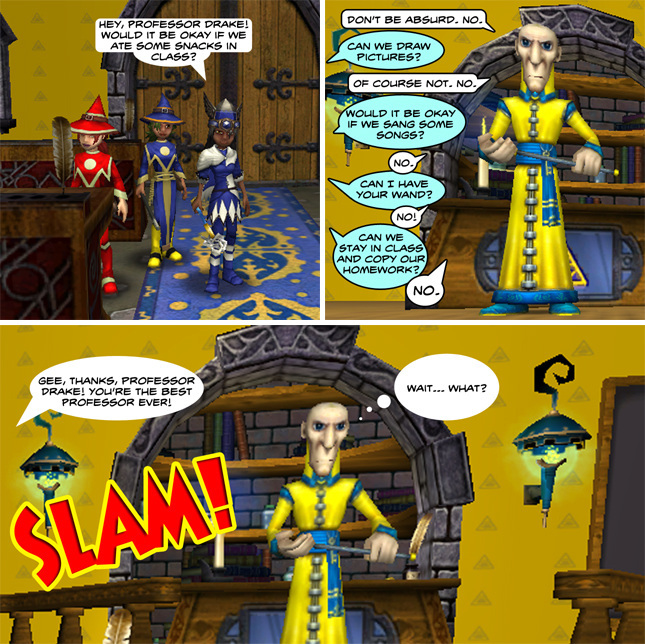 We inform you of the latest news in the popular online MMORPPG, Wizard101. Eggbert Returns to the Spiral! With blooming flowers, blue skies and spring festivities our friend Eggbert has come back to visit us in the Spiral! You can find Eggbert in the Shopping District by the water fountain, and you'll surely want to go visit him to see all the various Spring wands and the Pet Egg! Remember, these offerings will only be available for a limited time - so hop to it! Not only will you want to go see Eggbert, but we're also adding a Bunny Costume to the Crown Shop. Your Wizard can be Peter Cottontail hopping down the Wizard101 trail in this cool head-to-toe bunny suit! Can you put all the pieces together to discover the magic? Only one more till #100! 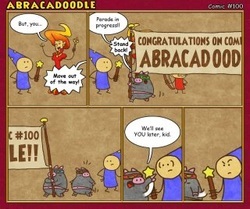 This is the Abracadoodle Comic #100! Love it! Needs more work! I don't like it. Copyright ©2012. We are NOT are official Wizard101 Fansite!